Hey friends, happy Friday! Can you believe April is almost over? WHAT the WHAT?? It's true, I checked. 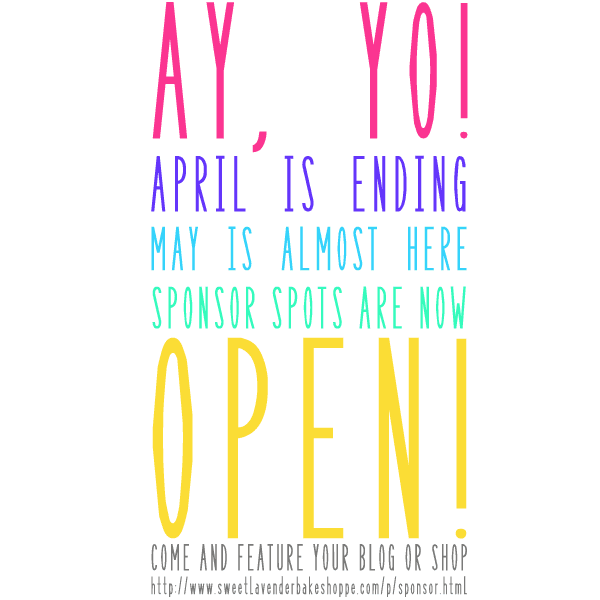 Anywho, with that knowledge this means sponsors are now being accepted for the month of May! YAAAAAAAY MAAAAAAAAY! Free blog button swaps are currently booked (until May 9th, so if you're interested in that, keep yer little eye open) but sponsor spots are ready and waiting! Why sponsor? Well let me tell you! TO EXPOSE YOUR BLOGGITY BLOG (and/or shop)! I offer a few different sizes and each one comes with it's own perks/pluses/pros/ring-a-ding-dings. I assure you, fun WILL be had. Also, because my little blog is growing by the day, this is a great (financially easier) way for you to get your name out there and show us who's boss. Or something. So, if you're interested in having yourself, your blog, and your shop featured, spotlighted, and shown, head on over here today! Spots are of course, first come, first served!